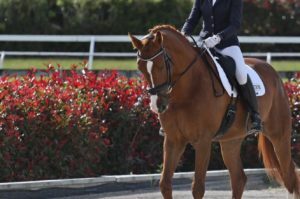 What goes on in our body is more often than not reflected in our horse when we ride. From a weak left side through to tight hips on the other side. All of these things can create little imbalances within our body which are then highlighted on our horse. So today I thought I would share with you some exercises to see how evenly balanced you are on each side. Use these exercises to improve the weak side by working more in this area. Lunges are a great way to see how stable we are through our legs. Start by stepping one leg back and lower your back knee towards the ground. If you have knee issues, don’t go to low. The aim being that you are trying to take your knee to the ground. Keep your body upright and don’t tip forward. Start with just a few reps each leg and build up to 10-15 each side. This is a great test of your balance and coordination. Something so important for riders. Keep your back leg on the ground if you find your balance isn’t there. Take is slowly and start with just a few reps each leg and build up to 10-15 each side. This is great for improving your back symmetry and core strength. Think of balancing a stick down the length of your back or a glass of water in your lower back. Don’t let it spill, keep the back still and stable. If you find it to much with both the leg and arm, start with just one and build up to both together. Begin with few reps each side and build up to 10-15 altogether. Often an exercise that will really highlight which side is stronger. Aim to keep your hips open by having your knees in line with your body ie no bend in the hips. Lift the hips off the ground and lower back down again. To make this harder, don’t have the bottom knee on the ground and lift the entire side of your body off the ground. Lower and lift at the rate of your breath. Start with just a few reps each side and build up to 10-15 each side. This is much harder that you would think. Start with both legs down and then work up to lifting one leg off the ground. Its a really powerful exercise to realise which side is weaker, even if you can just do one or two reps. Build up to 10 each side. 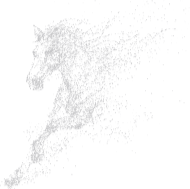 Our Online Dressage Rider Training Program is all about improving your riding biomechanics. 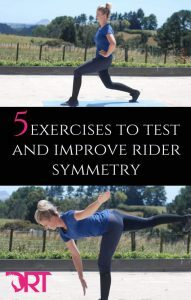 By using yoga, core and strength workouts to improve your riding symmetry and balance. 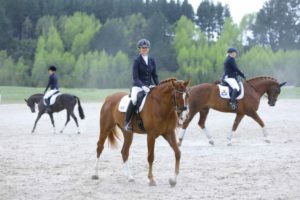 This is after a huge foundation of what dressage is all about. Learn more about the program here and take your riding to the next level!